Are you an office worker? Are these situations happen to you every day? - Working all day in front of my computer, at the end of the day your feet feel cramp and it takes some time to stand. - Your seat is not comfy enough, if you lower it, your foot touch the floor. If you raise it your foot dangling off the floor, so uncomfortable. - You already took of your shoes to feel comfortable, but it still makes your foot cramp, even when your foot already touches carpet floor. If you have the problems like that, this wooden foot rest is what you are looking for! 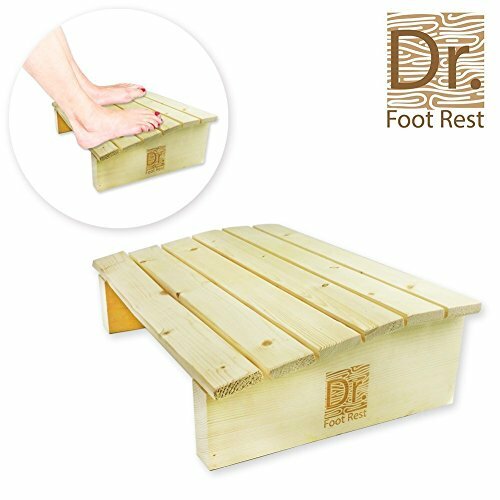 - This natural foot stool wood is the perfect solution to relieve all the tensions after a tiresome day. - It keeps your blood circulation normal and bring in so many health benefits. - This desk foot stool will make you comfortable no matter where you sit because it will block the cold coming from the floor, perfect as an office chair footrest. - The 17.7" width is just ideal, and the ascending design allows you to place your feet according to your convenience. - Made of the best non-toxic pinewood, this ergonomic footrest is unbreakable and will complement your decor perfectly. Many doctors said, please don't underestimate your muscle cramp and leg tension. If this happens every day, it is a warning to you. Don't wait till you sick, cause it will cost you more. Just CLICK ADD TO CART NOW and stay healthy. This under desk foot stool is a little investment for your future health. DON'T WAIT TILL YOU SICK - Please don't underestimate muscle cramp and tendon pain. In a certain amount of time, it can cause you back pain or even pinched nerves. When it happens it will cost you hundreds or even thousands of dollars to cure it. Prevents it with this under desk footrest. CURING FOOT PAIN, IS THAT TRUE? - Actually, it's not curing your pain but PREVENT IT. When your leg is dangling off the floor, somewhere in your hip muscle is overpress; causing tendon pains and abnormal blood circulation. This wooden foot rest prevents it and makes your feet in your best position. COMFORT? HOW COME? - This footrest stool is carefully designed to a certain degree so your feet feel natural and your blood circulation is normal. When your blood circulation is normal there will be no pain, ever! Put it under the desk at your office or home, and feel its comfort. STURDY NATURAL PINEWOOD - Unlike plastic footrest, this sturdy office foot rest will not break even if you stand on it with the max weight of 264.5 lbs. No need to worry about the habit of kicking and tapping while sitting at the desk, this ergonomic footrest can resist it since it's made of 100% natural pinewood. WANT TO TAKE IT AS GIFT? - Why not? It's a smart gift for pregnant moms or elders. Every mom will be grateful to have a comfortable place to rest their feet. Great choice for a gift, isn't it? Place your order NOW! Remember, this little investment can save your money and your health in the future. If you have any questions about this product by Dr. Foot Rest Wood, contact us by completing and submitting the form below. If you are looking for a specif part number, please include it with your message.